Thank you so much for your interest in DOLLCOCO! After I repeated trial and error, I made the Doll and opened DOLLCOCO in 2011.
the SL regular avatar for quite a while. And I've released new Ball-Jointed Doll Avatar and their clothing at last! Please visit my store and try the DEMO! I hope you like my new doll. in the future. Thank you for understanding. The bones of New Doll are the same positions as SL regular avatars. You can attach the Body parts to any attachment spots, they will go to the right places. *SL regular avatar cannot wear the Doll Eyes. 1) Detach all attachments from your avatar. Add the Alpha to hide your body. 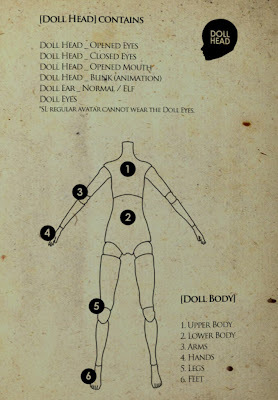 3) Wear the Doll Head and 6 parts of the Doll body. If you have any question or problem, please send me a notecard.